As we approach the midpoint of Community’s first season, the simultaneously best and worst thing we can say about the show is that it remains promising: For every artfully constructed laugh-out-loud (do the kids have an acronym for that? We can’t remember) moment there’s a creaky or overly quirky dump of verbiage that surely works better in the writers’ room than in the mouths of actual (Greendale!) human beings. In other words: the school’s impressively gay basketball team? Aces! Troy’s labored love of Styx? Groans. And so, episode nine. Before we get to it, a word of apology: We would have had this recap up sooner, but we decided to inaugurate a drinking game last night wherein we take a shot every time Shirley bugs her eyes at the camera. We were hospitalized before the second commercial break. The main story this week focuses on Greendale’s woeful (do they have any other type?) debate team while we mostly focused on the team’s (woefully!) underutilized coach, played by the delightful John Michael Higgins. Seriously, Community: it’s great that you can attract Arrested Development alums, but if they get better material in their DirecTV commercials then you’re doing something wrong. Anyway, in exchange for the promise of a parking space, “pointy-faced” Jeff agrees to partner with Annie in a big match versus City College, home of champion debater — and master electric-wheelchair driver — Jeremy Simmons, well-played by professional Shia LaBeouf–impersonator Aaron Himelstein. 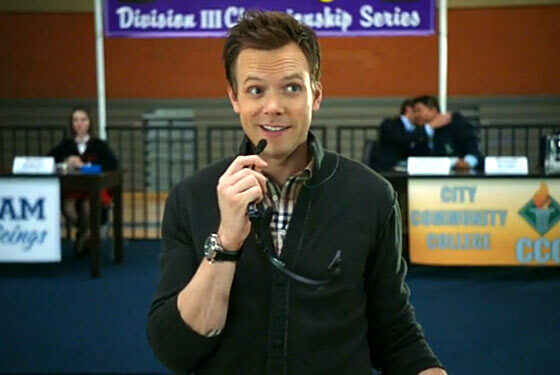 At first, Jeff takes the debate about as seriously as he takes anything at Greendale that doesn’t involve Britta or (apparently) looking at his nails: his American Idol–aping rebuttal earns him a zero. This leads to a pretty hilarious confrontation in the school halls where Simmons shows up to taunt “Adderall Annie” and instruct his eager adjutant to dramatically kick a trash can for him. Rising to Annie’s defense, Jeff gets serious, studies the Stanford Prison Experiment, squeezes into a Greendale cardigan and — after some wheelchair related high jinks — wins the debate. Of course, shoehorned into this storyline is the preposterous notion that somehow Annie and Jeff are prisoners to their heretofore-unseen smoldering sexual tension. Uh, really? And isn’t Jeff pushing 40 while Annie just graduated high school? We know he’s meant to be a creep, but this might be pushing it. Of course, this is no dig at the lovely Alison Brie. After her bang-up job dealing with Pete in her role as Trudy Campbell on Mad Men, we will never question her ability to inspire and inflame self-obsessed WASP males. It’s just that we prefer our sitcom characters to at least be consistent, no matter how cartoony the world they inhabit. Elsewhere, there was some silly business about Abed making soothsaying movies, involving doppelgängers of all of our main characters, in his filmmaking class. At least it gave him something to do this week! Better was the mini-subplot about Pierce trying to hypnotize Britta into quitting smoking, as it offered a reminder that, for all the high-stakes silliness Community attempts, the best jokes can sometimes be as simple as having Chevy Chase pratfall into a drum set. Does the fact that watching a 66-year-old man fall flat on his face (twice!) made us laugh more than anything else this episode prove that we, like all men, are evil? You can let us know in the comments, people. Double rejoinder away! Alan Sepinwall is also keenly aware of this week’s potentially statutory subplot. At EW.com, John Young thinks this episode was a return to form. At the A.V. Club, Todd VanDerWerff is maybe a little bit in love with Alison Brie.